Not every person goes into a career with a passion and hope of ending up at an NGO or charity, but earning a living elsewhere does not mean you have to close yourself off to business sustainability. Corporate Social Responsibility is all about finding the opportunity to implement economically, socially and environmentally sustainable practices within your current workplace. Today, corporations are now expected to assess and take responsibility for their effects on environmental and social well-being if they want to be deemed a respectful organisation. We had the opportunity to sit down with CSR expert and CEO of Edge Growth, Danny Hatfield, who explained that in the current global climate, sustainability and social responsibility are paramount to your business’s success. Impact funding or investing: Investments made into companies, organisations, and funds with the intention to generate a measurable, beneficial environmental or social impact alongside a financial return. Impact funding is a means of CSR. Enterprise and supplier development (ESD): The South African adoption of impact funding focused on black-owned SMEs. ESD is a means for companies to contribute to SMEs both within their value chain and across the broader South African economic landscape. ESD is one of five elements on the B-BBEE scorecard, legislated to help small black-owned businesses realise sustainable economic growth. Small to medium-sized enterprise (SME): A business that falls within decided (per country) limits, including the number of employees and annual turnover. In cases unlike yours, where CSR doesn’t form part of a company’s business model, can it influence their bottom line? Firstly, CSR affects your consumer, and in turn your top and bottom line. If you look at companies like Patagonia and so many other examples, consumers are wise to people and organisations that are socially responsible, and are making buying decisions accordingly. Your brand and how people resonate with who you are and what you do is very important. We’re seeing this more and more with the millennial generation, who are becoming a growing part of our consumer population. A lot of people say “customer comes first”. But could it be that actually, employee comes first. If you have happy and engaged employees they can deliver world-class service. And if your employees don’t believe in what you’re doing and don’t subscribe to your practices and policies, it affects how they work in the business. We did an exercise the other day where we simply got people to give “the one reason why they work at Edge”. It’s amazing how connected people’s answers are to purpose. Nowadays, particularly with a lot of the workforce being Generation X and Millennials, a business having a purpose and remaining true to that is so central to its employee retention and productivity, and so its success. On a more practical level, CSR accounts for 40 out of the 100 points on your BEE scorecard. Those points are made up of CSI and ESD (which includes procurement). The bottom line is, parastatals and large corporates buy based on your BEE score. This creates a ripple-down effect, where businesses only want to work with suppliers who are transformed to enhance their own procurement (ESD) points. So, whatever the size of your business, in order to get access to certain contracts you need to practise CSR. 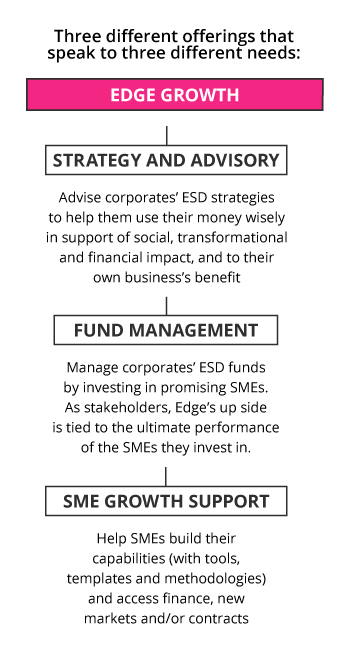 With ESD, it’s a real opportunity for corporates to grow and improve their core business by growing SMEs that can serve them. People automatically assume from small businesses you get more expensive products, but small businesses are often dynamic, agile, innovative and can get you products or services more quickly if they’re localised. ESD should be framed as something that you can use indirectly to support your own business. And often, if your ESD initiative doesn’t support a better core business, it’s not sustainable. Finally, CSR can enhance the stability and development of your surrounding community, which can become employees or buyers of your product. The reality is, look at Marikana. Those businesses have lost millions of rands because of the way they’ve engaged the community and managed social responsibility. So, if people don’t buy into what you’re doing and you’re part of a community, there can be a lot of negative implications as well. 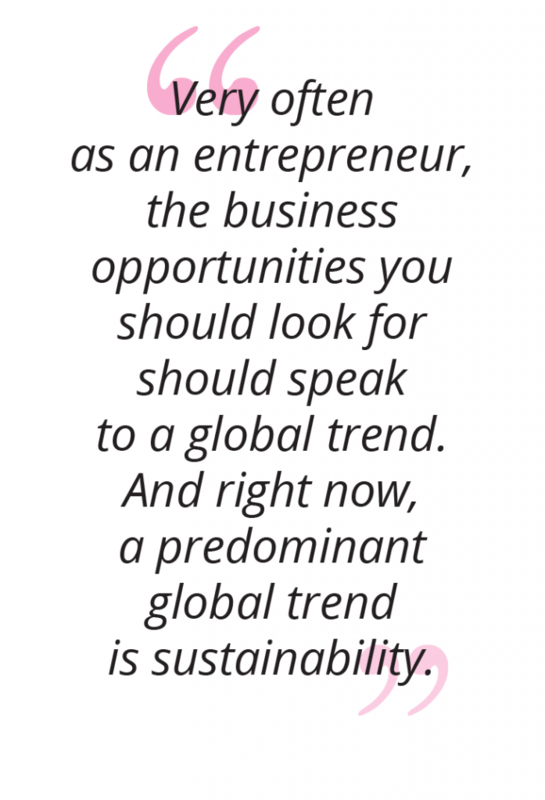 At Edge, business sustainability and success mean the same thing. How can entrepreneurs go about achieving a business model that inherently drives social impact and social responsibility? I think where the world economy is going now, a lot of what new businesses are starting to do is good – whether it be clean energy, a new form of building technology, healthcare or education. But if that’s absent and you’re not doing a business which inherently drives social impact, you have to always have an awareness of it. You need to (from the outset) believe part of the purpose for your business is to do good. Because otherwise by the time you grow, it’s too late – it’s not ingrained in your values and it’s not part of how you do business. Do you have any advice for businesses trying to choose the right CSI initiative for effective business sustainability? First off, I’m not of the belief that all CSI initiatives must be ESD initiatives – as per the current movement against grant-giving that’s going on at the moment. If you’re putting healthcare into a community – a grant – you may be building a community more likely to buy your product. So giving that grant has a sustainability element to it. I believe grant-giving is positive in the right way and context. 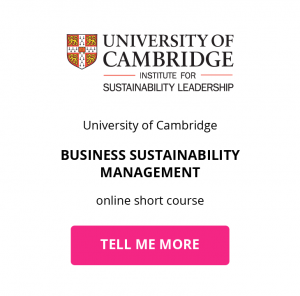 Secure the success of your business by implementing business sustainability in everything you do. Gain the skills you need to grow global concerns and shift landscapes within your organisation.